Happy Birthday Postcards from New York! 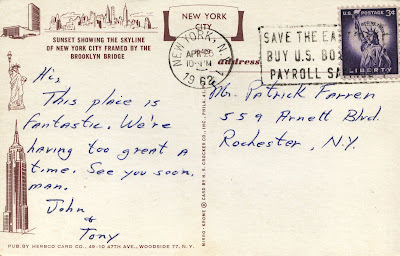 I cannot believe we have come so quickly to "Postcards from New York's" (PCFNY) first anniversary thanks to our loyal readers. We set out a year ago to create a photo/newsletter three to four times a month, which, just like a "Postcard," would be a momentary diversion from our much too busy work/life schedules, and the deluge of email in our in-boxes. These short snippets of stories were about things to do, see, taste and explore among the overwhelming feast of choices New York so abundantly offers every day, every time of year. PCFNY takes a minute to focus on "little" things that capture New York's many flavors; an unpretentious newsstand to enjoy a terrific egg cream soda along with a childhood memory, a quiet afternoon in a small museum, an unforgettable view, a winter walk through an ancient forest, an Upper East Side street corner to stand and listen to the Angelus ring from a nearby bell tower at dusk, or an only-known-to-the-locals restaurant for an intimate dinner for two. Thank you for your many enthusiastic emails, words of support and helpful suggestions. I'd love to hear a round of applause for our photographer, Joseph Knight, who is celebrating his birthday as well. His fantastic eye and relentless efforts to capture just the "right" shot have been the finishing touch to our picturesque stories. Finally, thank you to everyone who contributed stories about unique experiences and special places. I've lived in this area most of my life, but as a bridge-and-tunnel person growing up in New Jersey I was unaware of "The Little Red Lighthouse" until Hank Waxman "enlightened" me, first with great photographs and then his story. To kick off our second year let me begin with an appeal. Please! Send us "Postcards" from New York you have received from friends and family, and share your memorable stories about what makes New York so special to you. We'd love to discover "your" New York and possibly include it in a PCFNY Book about "Our Town." As we continue our quest to make PCFNY a valuable resource and a different-kind-of-guide, we want to hear from you about what you would like to see and hear more, or less of. What were your favorite stories? We heard that many of you download and collect PCFNY to share with family, friends, and business associates when they visit. Would you like to see Postcards compiled in a book? How about a coffee-table book of beautiful photographs of our magnificent parks, botanical gardens and unforgettable views? Or, a special subject book like a sweet tooth tour, terrific things to do with kids, a "dessert lover's" or "chocolate lover's" companion. No time to read Postcards, how about listening to them on a CD? We value your thoughts, so please take a moment right now to email your suggestions before you forget to: postcardsfromnewyork@yahoo.com. If you are on the webpage just scroll down and leave your suggestions in Comments.